Todd Jackson is one of the most decorated members of a UMaine men’s ice hockey team that was twice a national runner-up in the first half of the 2000s. In addition to being a four-time Academic All-American and the ’02-’03 Hockey East Defensive Forward of the Year, Todd was bestowed the honor of being elected team captain by his peers for the ’03-’04 season. After graduating, Todd spent time in the Detroit Red Wings minor league system and played for other professional teams in the United States and internationally. When Todd’s pro hockey days ended, he turned his competitive juices from the ice on a hockey rink to the felt (both real and virtual) on a poker table. That’s right…Todd Jackson is a real life professional poker player. As luck would have it, Fill The Steins has been looking for both a UMaine hockey player and a pro poker player with UMaine ties to participate in our Q&A; series. We both congratulate and thank Todd for checking both those boxes. So, without further ado, here’s our conversation with UMaine hockey great Todd Jackson, on UMaine, pro hockey, and the pro poker grind. Fill The Steins: Thanks for your time, Todd. First off, what was your major and year of graduation? FTS: Where’d you live while you were at UMaine? TJ: Freshman year I lived in Cumberland Hall, then I moved off campus and lived with Mike Mantenuto briefly, and then Cam Lyall. This might date me, but I lived walking distance to Ushuaia. Does that place still exist? I always thought they should franchise. FTS: Yes, that does date you and, no, Ushuaia definitely (and sadly) doesn’t still exist. Aside from those Ushuaia bikini and hardbody contests, what was your favorite memory from your time at UMaine? Off the ice, the Damon family put on an absolute feast for a group of us each week. It was so nice to have a home cooked meal and I think those dinners really solidified that group as friends I’ll have for the rest of my life. With a few exceptions, we’ve all made it a point to get together once a year at rotating locations since we graduated. FTS: Speaking of locations, on various social media, you’re profiled as living in LA and Vegas…do you split time? Which do you prefer and why? TJ: I guess I need to update my social media, but my wife and I moved to Vegas a year and a half ago. We both prefer the beach life of California but Vegas really just made the most sense. Fortunately, it’s a quick drive if we need a break from the desert. The only times I really go to the strip are to play poker or if friends are visiting. There’s life off the strip in Vegas. FTS: As a young hockey player, what made you choose the University of Maine? TJ: I wrote about how I ended up at Maine in my abandoned blog (“How I Became a Black Bear”). Before Maine was even in the picture, I had taken visits to a few schools, but nothing felt like the right fit. I was on the verge of committing to Princeton, when Maine lost out on one of their top recruits (and my teammate at the time), Jeremy Jackson. A few days later, I was meeting Shawn Walsh and on a flight to Bangor. Orono immediately felt like home. They put me up in the front row of the student section for a Maine vs. BU game and I had mentally committed before the puck even dropped. The energy and atmosphere was something I wanted to be a part of. I’ve always listened to my gut, and all signs clearly pointed to Maine. FTS: You earned a lot of individual and team accolades while at Maine…what are you most proud of from your time as a UMaine hockey player? TJ: Individual awards are nice and, at the time, I probably valued them much more than I do now. I was very proud to be elected captain by my teammates. That’s something I’ll always cherish. A couple years ago, I got rid of all my trophies. I did take a picture of each one in case I need to remember how awesome I once was. I’m proud of the progress I made in my 4 years. I’m most proud of the friendships I developed and maintained. Most of my closest friends today are the people I met at school. FTS: If you were back on the Orono campus, what’s the first thing you’d want to do? TJ: Well before I made it on to campus I’d stop in to Pat’s for pizza, zingers, and a milkshake. That was my favorite post-game spot. Then I’d go say hello to the Alfond. FTS: What a coincidence…Pat’s is Fill The Steins’ favorite pre-game, post-game, and (sometimes) during-game spot. But enough about us, let’s talk about your pro hockey career. Tell us about your experience in the Red Wings minor league system. Overall, would you characterize it as positive or negative and why? TJ: For the most part, positive. I was given an amazing opportunity that few get to experience. I never made it to the NHL, and that inherently feels negative, but I now realize the NHL shouldn’t be the metric for what’s considered a successful career. How far you make it is arbitrary. It’s all about what you do with what you have, and I don’t have a lot of regrets with that. It was a hell of a ride. FTS: On that ride, what’s the best road story you have from your time as a pro hockey player? TJ: What happens on the road, stays on the road. FTS: Fair enough, especially coming from a Vegas man. Let’s get into the “Vegas side” of your life. When did you first start playing poker…as a kid? While at Maine? Who introduced you to the game? TJ: I believe I was a junior at Maine when Chris Moneymaker won the World Series of Poker (WSOP) Main Event and it really ignited a poker boom. A group of us, spearheaded by Troy Barnes, started having poker nights and that’s when I discovered online poker. A few of us got really into it and would play all through the night and go straight to 6am lift on no sleep. That was always a terrible idea. 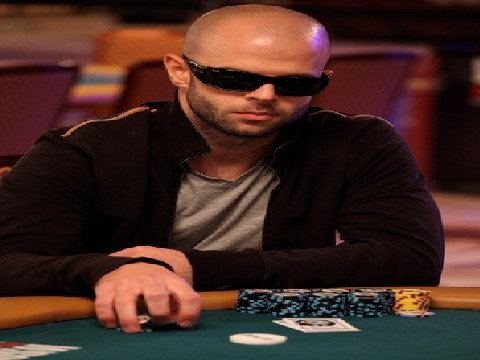 FTS: How did you make the transition from professional hockey player to professional poker player? TJ: As a professional hockey player, you have a lot of down time. On a regular practice day, you might be home by noon. So I started putting a lot of time into studying and playing online poker. I was basically break even/losing for awhile and decided to make a final deposit of $1,000 and see what I could do with it. If I busted, my plan was to quit poker. Who knows if that would have actually happened. Fortunately, I was able to build a bankroll. By the time my hockey career was winding down, poker was becoming more lucrative than hockey and it just felt like a natural transition. FTS: At the poker table, what’s your best game? TJ: 99% of my play is in limit hold ’em cash games. I’ve put all of my energy into learning this one variation. FTS: What’s your best result in a cash game? What and where were you playing? TJ: I made around $10,000 in one day playing $50/$100 limit online. Unfortunately, I lost about the same five days later. This was a few years ago and I no longer play at those stakes. FTS: Although you spend most of your time playing cash games, your Twitter profile picture looks like it was taken at the World Series of Poker…do you play many tournaments? TJ: I do play a few WSOP events each year, because there’s life changing money in those, but in general I stick to mid-limit cash games. FTS: What’s your best tournament result? TJ: I won an online satellite to the WSOP Main Event, which was valued at $12,000. Playing live, I won a tournament for $8,550 plus a $1,500 seat to a WSOP event. FTS: What’s your favorite card room to play in and why? TJ: Because I only play limit hold ’em, the Bellagio is my only option for live poker. It’s the only casino in Vegas that spreads limits high enough to make a living at it. In California, I played at the Hustler Casino, but the Commerce Casino is probably the limit hold ’em mecca of the world. I was just too lazy to make the drive when I lived in California. TJ: My biggest bluff in the biggest game I ever played was in an online limit hold ’em game. It was a $200/$400 game, meaning the blinds were $100/$200, the bets pre-flop and post-flop are $200, and the bets on the turn and river are $400. I’m in the big blind with T8 of diamonds. It folds to the button, who’s a world class player, and he raises. The small blind folds and I call. Flop comes 7spades/2spades/2clubs. I check, he bets, I call. This is a pretty debatable call, but he’s opening action on the button with such a wide range of hands (maybe 80% of his hands) and betting almost any flop. So if I spike a pair on the turn, I’m most likely good. But that’s more my back up plan. I was a new player at this level and up to this point I felt he was trying to run me over and force me to make hands. I had been playing very tight up to this point. So my plan was to check/raise any turn card and he would have to fold all but the strongest hands. This hand was over 5 years ago and my line of thinking would be much different today. The 9clubs rolls off on the turn, which is actually a great card for me, improving my equity with an open ended straight draw. I’m expecting my opponent to fold to my check/raise (for the reasons stated), but I wouldn’t be shocked by a call, considering there are now two flush draws that I could be semi-bluffing. I was prepared to fire out one last $400 bet on any river card but instead, I was quickly faced with a terrible reality. He three-bets me on the turn, which I wasn’t prepared for. I panic. What the hell am I doing? Why am I even playing in this game? This pot is already over $3,000 and I have ten high. At this point, a lot has to go right for me to win the pot. There’s the possibility I’m drawing dead (if he has a full house), and will lose even if I make my hand. I call his three-bet on the turn and send a quick prayer to the poker gods. The river is a devastating 7diamonds. I check, planning to surrender the pot. He bets and before rationality even had a chance to intervene, I slam the “raise” button and he goes into the tank. It probably lasted 30 seconds, but it felt like an hour of pure fear and regret, while he contemplated his options. Finally, he folds and the $4,900 pot gets shipped my way. I don’t know if it was a moment of brilliance or desperation, but I realized I was not ready for this level, financially or emotionally. FTS: Wow. We don’t think we’re ready, financially or emotionally, to even handle that story. On the other hand, what do think the best lay down you ever made was? FTS: Good thinking. After all, you can’t win if you fold, right? On a more serious note, how have you been impacted by poker’s “Black Friday“? TJ: It’s been significant. I had a large percentage of my net worth on one online site, which happened to be insolvent once the Department of Justice cracked down on them in 2011. It’s been over two years and I still haven’t seen my money, although there has been progress recently. So it was a scary time because I really wasn’t sure how I was going to support myself. Although live poker is notoriously easier to beat than online, I hadn’t proven myself “off-line.” The transition to live poker was difficult at first. The pace is much slower. Online, you’re seeing hundreds of hands per hour. Live, you’re seeing 20-25. So I really had to adapt to the pace and avoid boredom and work on my focus. Interacting and meeting new people was a nice byproduct of Black Friday. It got me out of the house. But now that online poker is regulated in Nevada, I’ve gone back into hiding and play mostly online and avoid the strip altogether. FTS: Given the uncertainty you mentioned with online poker, as well as the general uncertainty that comes with being a poker player, do you plan on playing poker professionally for the rest of your life or is there another endeavor you’d like to pursue? TJ: I don’t really know. I’m kind of right in the middle of trying to answer those questions. I didn’t have some master plan for life after hockey. I just kind of fell into this and can’t think of anything I’d rather do. It’s nice to be your own boss and have that freedom, but it’s not an easy way to make a living. You really have to be able to handle the swings. And nobody can predict what poker will look like in the future. I’m fortunate to have a wife that is supportive of what many might consider a risky career choice. It is risky. There’s a lot of variance, but at this stage of my life I’m comfortable on unstable ground. If/when we have a family, I imagine I’ll have a much lower risk tolerance. I’m using some of my free time to learn how to code. Hopefully that will give me some alternatives to poker whenever that time comes. FTS: Last, but certainly not least, what are you filling your stein with these days? TJ: Does fresh squeezed orange juice count? Lame answer, but my stein doesn’t get a lot of action these days. But in general, I’d rather spend $12 on one well crafted drink than go to Boston’s Pizza for 2 for 1 pitchers. We’re grateful to Todd for taking some time away from the virtual felt to visit with us. We Fill The Steins to Todd, to his contributions to UMaine, and to his continued good fortune at the poker table!